The relationship of Metalair Ltd, Wokingham, Berks, who at one time made synchronous electric clocks, to present day companies with Metalair in their names is not clear. During the Second World War Metalair made metal aircraft components, and John Nuttall has located two advertisements, published in 1941 and 1943, offering their services. He believes that after the war Metalair diversified into other products, including synchronous clocks, but points out that they are not listed in directories of old clockmakers. This probably dates Metalair synchronous clocks to the late 1940s. Clocks with guarantee cards dated April and May 1947 are known. Malcolm Whatley, the son of the founder of Metalair, states that, after the war, contracts were few and far between, and to keep the business going Metalair manufactured electric clocks, anodised tea trays, children’s tricycles, and the first rotary lawn mower called the Ladybird. After the founder’s death in 1956, the company had to be sold to pay death duties, and the company is believed to have moved to the Norfolk area. In some Metalair clocks power is supplied via a 2 pin 2 A connector. 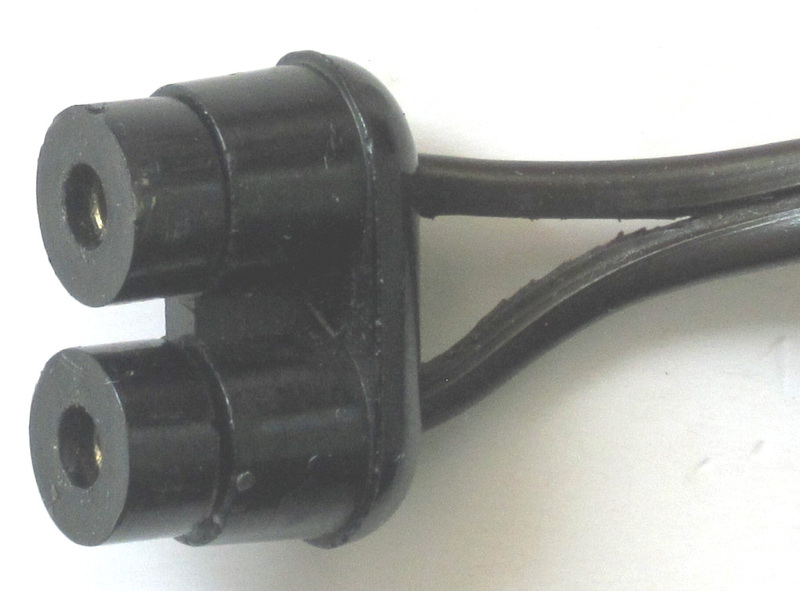 The design of the female connector differs from that used by other manufacturers, see below. For more information on a clock click on the link. If no link see POOK L P. British domestic synchronous clocks 1930-1980. The rise and fall of a technology. Springer, 2015. I have a small, painted aluminium-cased Metalair Wokingham, Berks. 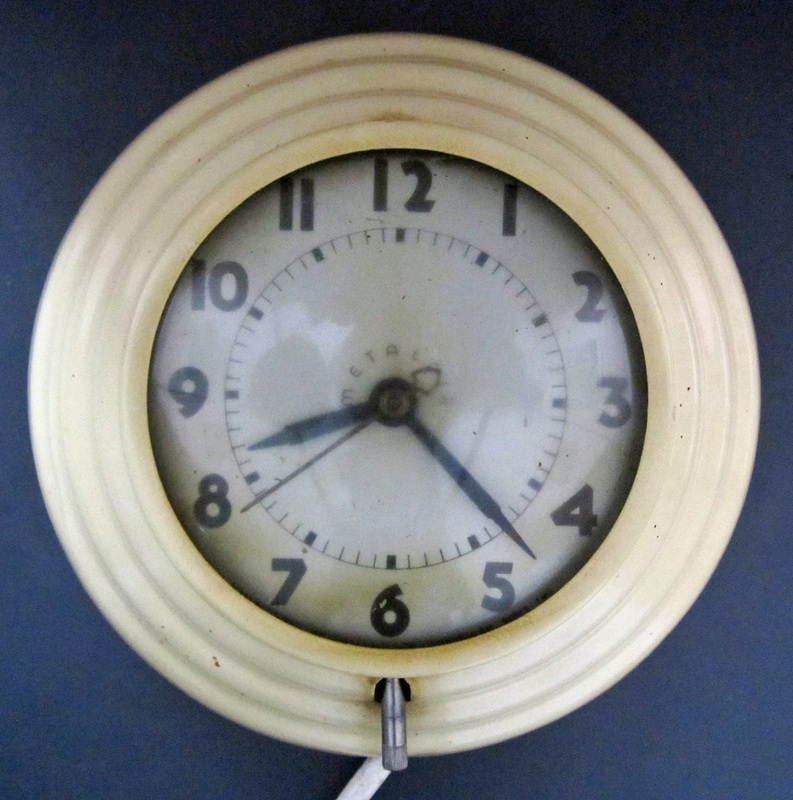 wall clock which seems to have a very similar movement and dial to the one in your article. 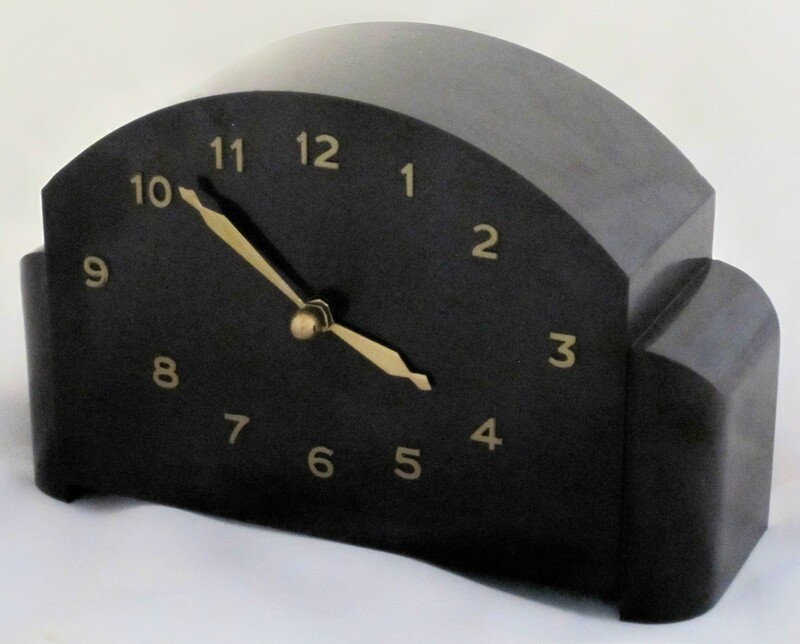 I would be grateful if you could give me any further information on this company such as when clocks like this were produced and what happened to Metalair…and why the curious name! I can send photos if that will help. Thanks for your comment on your Metalair clock. All I know about Metalair is that there are still companies with Metalair in their name. I’ve posted a query to a discussion group in the hope that someone might be able to supply some information. I won’t post a public reply to your comment until I know the outcome. In the meantime I’d certainly like to see pictures of your clock. 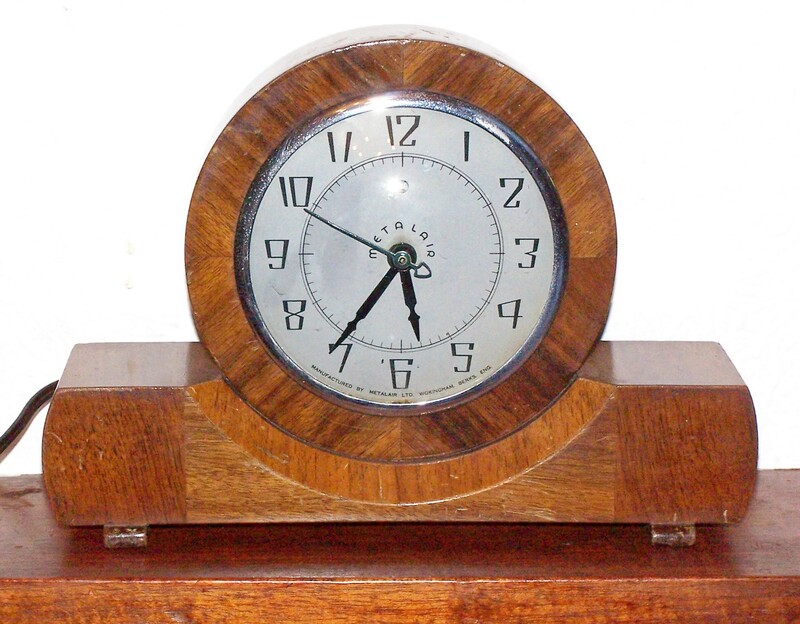 My guess is that Metalair synchronous clocks were made in the 1930s, but I have no definite information. Available information, courtesy of John Nuttall, suggests that Metalair synchronous clocks were made in the late 1940s, and I have added a short note giving the background. My father started Metalair around the time of the second world war,at station point wokingham berks, after the war, contracts were few and far between and to keep the business going he manufactured electric clocks,anodised tea trays childrens tricycles,and the first rotary lawn mower called the Ladybird. I was born in 1938, and on his death in 1956, we had to sell the Co. for death duties. Shortly before he died he developed a welding process to manufacture aluminium containers for lorries similar to the big drums you see on cement lorries. I believe the company moved to the Norfolk area. I have a pink Bakelite Metalair clock in its original box, with guarantee card. Sadly, it does not work. The movement is very oily. I’m trying to work out the dimensions for any potential generic connector. You suggested in an earlier post that the Metalair has the most restricted aperture. Is there any way for you to send me a picture of the opening on the rear of the Metalair and the exact dimensions, i.e narrowest pinch point, widest aperture, maximum depth – cover to pin-base – of the restricted zone? I can give you an email address if you can’t send via wordpress. As you say, the TMC seems to fit all my clocks except a Tempex which has an opening approx. 1mm smaller all round than a TMC connector. The Metalair connector looks similar to the one used by Gent but with smaller diameter caps. As any new design for a connector would have to integrate a cable grip, it would be useful to know if you have an idea of maximum length, cable to tip, that would avoid fouling any clock you have encountered. Although, I have a Temco wall clock that is too shallow for even a TMC connector! It seems possible that anything with an in-line RCD fitted would pass the ‘is it safe’ test for second-hand electrical goods such as clocks. This may all come to nothing but it’s worth a try. I don’t think length would be a problem for clocks with doors. There is 4 inches clearance in a Smith granddaughter clock and 3 inches in a Temco granddaughter clock. Some wall clocks were designed for hanging over a dedicated recess with a power supply so designers weren’t concerned over clearance. We had one house which had such a recess in the kitchen.